Caribbean Central American Action (CCAA) is pleased to announce that the next installment of the Disaster Management Workshop Series (DMWS) will take place on September 3, 2015, in Tortola, British Virgin Islands (BVI). Under the banner of “Ensuring a Resilient Economy through Partnership in Disaster Recovery”, the BVI workshop will be hosted in collaboration with the The Government of The Virgin Islands, the Department of Disaster Management of the Virgin Islands, the BVI Chamber of Commerce and Hotel Association (BVICCHA), Rotary Clubs of the British Virgin Islands, and H. Lavity Stoutt Community College, together with longstanding series partner, Tropical Shipping. The program will feature leaders from government and the private sector, and will be structured around presentations and collaborative discussions geared towards supporting existing public-private collaboration in disaster recovery, and providing information on new tools and strategies that foster this collaboration. The DMWS has been a flagship program of CCAA for the past decade. It brings government and the private sector together with disaster resilience professionals to discuss the importance of partnerships in the recovery planning process and to support the incorporation of disaster planning into daily operations. The event includes the signing of an inter-organizational Statement of Purpose to provide ongoing collaboration and support. The event will take place from 8:00 a.m. – 1:30 p.m. at Maria’s by the Sea Hotel and Conference Center, Road Town, Tortola. If you have any questions or are interested in attending please contact Sally Yearwood (syearwood@c-caa.org) at CCAA, Leroy Moses (lmoses@tropical.com) at Tropical Shipping, or Sharleen Dabreo at (sdabreo@surfbvi.com) at the Department of Disaster Management. 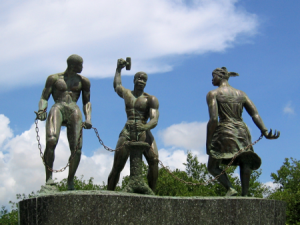 WILLEMSTAD – A slave revolt took place in Curaçao on August 17, 1795 led by Tula, a local slave, and resulted in a month-long conflict on the island between escapees and the colonial government. This revolt was commemorated yesterday at the slave monument at Rif. The western side of the island called Bandabou had between 4,000 and 5,000 inhabitants in 1795, mostly enslaved. The slave Tula had been preparing the insurrection for some weeks. On the morning of August 17, 1795, at the Knip plantation of slave master Caspar Lodewijk van Uytrecht, Tula led an uprising of 40 to 50 people. The enslaved met on the square of the plantation and informed van Uytrecht they would no longer be his slaves. He told them to present their complaints to the lieutenant governor at Fort Amsterdam. They left and went from Knip to Lagun, where they freed 22 slaves from jail. From Lagun, the liberators went to the sugar plantation of Santa Cruz, where they were joined by more rebels under Bastian Karpata. Tula then led the liberated people from farm to farm, freeing more people. The slave owners had now retreated to the city, leaving their plantations unprotected. At the same time, a confederate French slave, Louis Mercier, led another group of freed slaves to Santa Cruz, where he took the commandant, van der Grijp, and ten of his mixed race soldiers as prisoners. Mercier also attacked Knip, where he freed more slaves and took some weapons. He then rejoined Tula, locating him by following the trail of destruction Tula had left behind. The rebels began a guerrilla campaign, poisoning wells and stealing food. On September 19, Tula and Karpata were betrayed by a slave. They were taken prisoner, and the war was effectively over. (Louis Mercier had already been caught at Knip.) After Tula was captured, he was publicly tortured to death on October 3, 1795, almost seven weeks after the revolt began. Karpata, Louis Mercier and Pedro Wakao were also executed. In addition, many slaves had been massacred in the earlier repression. After the revolt had been crushed the white Curaçao government formulated rules that provided some rights to slaves on the island. August 17 is celebrated each year to commemorate the beginning of the liberation struggle. When the race based system of slavery was finally abolished on the island in 1863, there were fewer than 7,000 slaves. 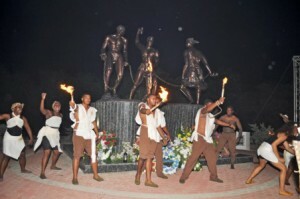 The commemoration took place at the monument dedicated to Tula and the rebels. This monument is located near the Holiday Beach Hotel. It is the site where Tula was executed. Q: The “Nuclear Zero” lawsuit filed by the Republic of Marshall Islands (RMI) against the nine nuclear nations to adhere to the Non-Proliferation Treaty (NPT) was denied in February by Judge Jeffrey White in U.S. Federal District Court (SF). RMI Foreign Minister Tony de Blum wants the U.S. and other nuclear nations to negotiate in good faith for nuclear disarmament, so why did this lawsuit get denied, and is the Appeal brief filed on July 13th an indication of ‘no backing down’ by the Marshall Islands? Krieger: The lawsuit against the United States in U.S. Federal District Court was denied on jurisdictional grounds, having to do with standing and the political question doctrine. The Marshall Islands and its legal team believe the judgment was in error, and the ruling was appealed to the Ninth Circuit Court of Appeals (SF) on July 13th. Q: Judge Jeffrey White’s decision noted that the Non-Proliferation Treaty’s fundamental purpose is to slow the spread of nuclear weapons, and to bar the non-nuclear countries from acquiring nuclear weapons. However, the Marshall Islands lawsuit focuses on the continuing breach of the treaty’s nuclear disarmament obligations. Do you think the judge’s decision to dismiss this case was based on a fundamental difference in the interpretation of the NPT’s core purpose? Do you think the number of groups filing Amicus Briefs with the Appeal [in support of the Marshall Islands] indicates that total nuclear disarmament should be seriously addressed, instead of just modernizing the arsenals? Krieger: The judge was not correct in focusing only on the treaty’s provisions for preventing the spread of nuclear weapons. A critical element of the Non-Proliferation Treaty is Article VI, which calls for negotiating an end to the nuclear arms race at an early date, and achieving nuclear disarmament through good faith negotiations. The judge omitted from his decision reference to the importance of the nuclear disarmament provisions of the NPT. Many parties to the NPT consider the nuclear disarmament obligations to be the most important obligations of the treaty, and certainly a tradeoff for preventing proliferation to other nations. The goal of the treaty is to obtain a world with zero nuclear weapons – no proliferation of nuclear weapons, and good faith negotiations for nuclear disarmament by the countries that already have nuclear weapons. Q: The Nuclear Zero lawsuit's Appeal Brief was officially filed on July 13, in the Ninth Circuit Court of Appeals (SF). Secretary of State John Kerry was also trying to wrap up a nuclear agreement with Iran on that day. What do you think of the U.S. establishing a new nuclear agreement with Iran, when the Marshall Islands Nuclear Zero lawsuits assert they [and other nuclear nations] haven’t lived up to the former international treaty agreements of the Non-Proliferation Treaty? Q: The Nuclear Zero lawsuits by the Marshall Islands were also filed at the International Court of Justice (ICJ). However, the U.S. has rejected the compulsory jurisdiction of the ICJ, and considers any judgments of that court to not be binding on the U.S. Considering this dilemma, what would a victory at this international court bring in the long run? Krieger: The Marshall Islands also brought the Nuclear Zero lawsuits against all nine nuclear-armed nations to the International Court of Justice. However, the way the ICJ works is that only the countries who accept the compulsory jurisdiction of the court can be held into the lawsuits. Among the nine nuclear armed countries, only India, Pakistan, and the United Kingdom accept the court’s compulsory jurisdiction. The other six countries, including the U.S., do not accept the court’s compulsory jurisdiction, and can only be invited to join the case. None of these six have joined thus far. The legal system at the international level is equivalent to a situation where someone is injured by corporate misconduct, and the injured party would have to invite the defendant to court, rather than there being compulsory jurisdiction to assure the defendant does not have a choice about showing up in court. That is an important reason why a separate case was initially brought against the U.S. in U.S. Federal District Court (SF). If the U.S. can’t be held to account for its treaty obligations at the International Court of Justice, and it also can’t be held to account in its own federal courts, then how can any country have confidence in entering into treaty obligations with the U.S.? The Marshall Islands can still prevail in their cases at ICJ against India, Pakistan, and the U.K., since these three countries have compulsory jurisdiction. Should the Marshall Islands win its case against the U.K., it would have important implications for the other four nuclear-armed countries that are parties to the NPT. If the international court declares that the U.K. is not in accord with its obligations under the treaty, then that would reflect on the similar obligations owed by the U.S., Russia, France, and China. But a victory in these cases will be won not only in the courtroom, but in the court of public opinion. People everywhere need to understand that the nine nuclear-armed countries are not fulfilling their obligations to end the nuclear arms race, and to achieve nuclear disarmament. Quite the opposite, they are engaged in modernizing and improving their nuclear arsenals. The people of the world have to say to their leaders, “Enough is enough.” If we want to have a human future, we need to stop playing nuclear roulette. Q: The recent Obama administration proposal for approximately $1.1 trillion for modernizing the U.S. nuclear arsenal (weapons, submarines, bombers, ICBMs, and the infrastructure of the nuclear weapons complex) does not align with compliance with the Non-Proliferation Treaty, even with the reductions in the number of nuclear weapons under the New START Treaty. Do you think the world is more at risk of a nuclear war with nuclear nations modernizing their arsenals, even with fewer weapons overall? Krieger: Modernizing nuclear arsenals does not align at all with international legal obligations under the NPT and customary international law. It demonstrates that the most powerful countries in the world are continuing to rely on their nuclear arsenals, and to improve them despite their obligations under international law. This is a recipe for further nuclear proliferation, and puts the world at greater risk of nuclear accidents, nuclear miscalculations, and nuclear war. A great danger of modernization is that the weapons will be perceived by their possessors as being more accurate, and therefore, more usable. They want to reduce the numbers but increase the usability of the weapons. Because the world previously went to the insane number of 70,000 nuclear weapons doesn’t mean that having only 16,000 in the world now makes us substantially safer. We’re playing a very dangerous game with nuclear weapons, and the use of even a dozen or so nuclear weapons could destroy the U.S. as a functioning country. The use of only a few hundred nuclear weapons could leave civilization in shambles. I consider the current approach of the U.S. and the other nuclear weapon states to modernizing their nuclear arsenals to being akin to playing nuclear roulette. It is like metaphorically loading nuclear weapons into the chambers of a six-shooter, and pointing the gun at humanity’s head. Q: The Non-Proliferation Treaty was signed in 1968 and entered into force in 1970, and yet there have been no multilateral negotiations to eliminate all nuclear weapons in the 45-year history of that treaty. The Marshall Islands’ lawsuits highlight that there are over 16,000 nuclear weapons still remaining in the world, with approximately 2000 nuclear weapons on high alert status. The lawsuits assert that immediate negotiations for disarmament are required, and that the nuclear nations have failed in these obligations. What do you think about issues of terrorism, national security, and foreign affairs affecting U.S. decisions about nuclear disarmament? Krieger: The legal obligation of the parties to the Non-Proliferation Treaty, including the U.S., is to engage in good faith negotiations for an end to the nuclear arms race and for nuclear disarmament. If the U.S. were doing this and achieving success in eliminating nuclear weapons, the threat of nuclear terrorism would be substantially reduced, if not eliminated. Further, it is in the national security interest of the U.S. to achieve the global elimination of nuclear weapons, because it is the one type of weapon that no country, including the U.S., can protect itself against. In terms of U.S. foreign relations, the U.S. should adhere to its legal obligations, including its nuclear disarmament obligations under the NPT. Krieger: The New START Treaty is a step in the right direction, if it is followed by other significant steps. However, the Non-Proliferation Treaty calls for nuclear disarmament rather than arms reduction only. The New START Treaty is an arms reduction treaty, not a nuclear arms elimination treaty. The U.S. seems to believe in a step by step approach to nuclear disarmament, but many see this as a means of putting off nuclear disarmament indefinitely. At the end of April 2015, the parties to the NPT met at the U.N. for their ninth 5-year review conference of the treaty. It seems clear from previous international meetings in Oslo, Norway (2013), in Nayarit, Mexico (2104), and recently in Austria at the Vienna Conference on the Humanitarian Impacts of Nuclear Weapons, that most countries in the world are not satisfied with the progress that has been made toward nuclear disarmament, especially given the terrible humanitarian consequences of nuclear weapons use. These countries pay close attention to whether the U.S. and the other nuclear weapons states who are parties to the NPT are taking their nuclear disarmament obligations under the NPT seriously. Q: Marshall Island foreign minister Tony De Blum has argued that he is taking international action because his population of 70,000 islanders has greatly suffered from the effects of 67 major nuclear tests by the U.S. in the past, and now the atolls are also threatened by rising sea levels. The lawsuits don’t seek redress for their suffering. Instead, they emphasize their radioactive contamination to prevent future suffering in the world, to remove this threat from the world. Is the debate of climate change tied to nuclear issues a legitimate concern for the survival of humanity? Krieger: Nuclear devastation and climate change are the two most significant global survival issues confronting humanity. The Marshall Islands are at the forefront of seeking solutions to both issues. It is a small but bold and courageous country. We should all be thankful to the Marshall Islands for being willing to speak out on these issues and take the legal actions that it has. Climate change is predicated on global warming taking place, and even a relatively small nuclear war could send the world plummeting into a new Ice Age. In a war between India and Pakistan, if each country used 50 Hiroshima-size nuclear warheads on the other side’s cities, it could result in crop failures leading to the deaths of approximately 2 billion people due to nuclear famine. Q: The U.S. Conference of Mayors also adopted a major resolution backing the Marshall Islands in their Nuclear Zero lawsuit, and several of the mayors also filed an Amicus Brief to the Ninth Circuit Court of Appeals in support of the appeal. The mayors’ resolution states that the U.S. and eight other nuclear nations are “investing an estimated $100 billion annually to maintain and modernize their nuclear arsenals while actively planning to deploy nuclear weapons for the foreseeable future.” The mayors are calling on the President and Congress to “reduce nuclear weaponry spending to the minimum necessary to assure safety and security of the existing weapons as they await dismantlement.” Do you think this is a bold move by the mayors of our nation to want Congress to redirect military spending to domestic needs? Krieger: It is actually a very smart and sensible move by the U.S. Conference of Mayors. Our cities need resources for infrastructure and the wellbeing of our citizens. It makes great sense to redirect the planned trillion dollar expenditure on nuclear weapons to improving our infrastructure and helping improve our housing, our healthcare system, and the education of our children. The federal government would do well to listen to the demands of the mayors of our cities, rather than waste our resources on unusable weapons of mass annihilation. It was extraordinary that the mayors stood up for the Marshall Islands lawsuit and backed them in their Resolution. It is extremely reaffirming that the U.S. Conference of Mayors supports these lawsuits. Their resolution reflects an understanding that every city in the world is a potential target for the devastation that would be wrought by the use of nuclear weapons. Q: What other support have the Marshall Islanders received tied to these lawsuits? Krieger: It has been heartening to see how much support the Marshall Islands have received. In addition to the U.S. Conference of Mayors, the Marshall Islands lawsuits have been supported by major civil organizations, including Greenpeace International, the International Physicians for Prevention of Nuclear War (including Dr. Helen Caldicott), the World Council of Churches, the International Lawyers Against Nuclear Arms, and the Nobel Women’s organization. It has also received the support of many individual leaders, including Nobel Peace Laureates Archbishop Desmond Tutu, Mairead Maguire, Oscar Arias, Jody Williams, and Shirin Ebadi. More than five million people have also signed a petition in support of the Nuclear Zero lawsuits filed by the Marshall Islands. ¿Está Puerto Rico en una situación pre-revolucionaria? Las realidades vitales de nuestro país y el deterioro en las relaciones con la metrópoli sugieren que sí. No pasamos, sin embargo, de la situación “pre-revolucionaria” o “preparatoria a cambios fundamentales” al logro de tales cambios, por causas y factores muy importantes que necesitan analizarse y explicarse con claridad. Diversos observadores y teóricos de las situaciones revolucionarias, en diferentes experiencias de la humanidad, han concluido que existe una situación pre-revolucionaria cuando las clases sociales y sectores ciudadanos beneficiarios del régimen existente empiezan a no poder serlo, como antes. Cuando, sobre todo las clases medias, han tenido logros socioeconómicos importantes pero comienzan a perderlos. La pérdida de lo que antes se tuvo de progreso, más que la pobreza y ausencia total del mismo, es lo que conduce a movimientos certeros y exitosos hacia cambios fundamentales en la vida política, económica y social de las sociedades. Una mirada a lo que ha acontecido en Puerto Rico durante todos estos años de recesión económica y crisis fiscal demuestra que, según todas las clases sociales mejoraron sensiblemente su situación económico-social en los tiempos de bonanza en la economía del Puerto Rico territorial (1950-1970), ahora casi todos los sectores van perdiendo posiciones ganadas, la clase media se achica y se halla en riesgo de deslizarse hacia abajo en la escala económico social y en su calidad de vida, y la situación general del País es de incertidumbre. Esto se suma a los miles de puertorriqueños, de diversas clases sociales, que han perdido millones en sus inversiones fracasadas a causa de la crisis o que han perdido su casa propia, hasta sus hogares, a consecuencias de la debacle económica que vive el País. Son condiciones, todas ellas, de las cuales suelen surgir situaciones pre-revolucionarias y grandes cambios. ¡Tío Sam no te quiere! Las relaciones con la metrópoli, que en otros tiempos lucían favorables a la mayoría de los sectores del País, de algún modo, a pesar de la condición territorial, se han tornado ahora muy negativas. Repasemos: Estados Unidos se niega a rescatar la economía de nuestro gobierno de la crisis fiscal a pesar de que la responsabilidad por la tal crisis es tanto de ellos como nuestra. Primeramente, porque las condiciones territoriales dificultan que nuestro gobierno pueda estimular la economía puertorriqueña en tiempos de la globalización y ellos no hacen nada para modificarlas; segundo, porque los tratados de libre comercio de la propia metrópoli con otros países han echado al piso nuestra anterior posición de privilegio y competitividad en el mercado estadounidense, y tampoco se ha diseñado algo para enfrentar eso; tercero, porque EEUU eliminó la 936 y otros tratos contributivos que antes beneficiaron la economía puertorriqueña y se niega a aprobar otros nuevos; cuarto, porque los programas federales para los pobres van a la baja. Ya hemos visto los datos de cómo pagamos igual para el Medicare, pero recibimos menos que los estados. Y los fondos del PAN y otras ayudas se han puesto más restrictivos. Quinto, y más grave, porque la metrópoli sólo nos sirve indiferencia y realimentaciones negativas. Nos culpan sólo a nosotros de la crisis fiscal, cuando ellos también tienen responsabilidad. Recientemente Bloomberg citó datos que demuestran que bancos importantes controlados por el gran capital estadounidense e internacional, como UBS, Citigroup y Goldman Sachs, mediante sus operaciones en nuestro país, se llevaron de Puerto Rico tanto como $900 millones tan sólo en cobros (fees) por el “servicio” de manejar una nueva deuda de 126.6 millardos (billions) desde el año 2000 hasta hoy, deuda en la cual incurrió el gobierno de Puerto Rico ya excesivamente endeudado. Para lucrarse ellos, promovieron mayores deudas de nuestro gobierno interno en contubernio con una clase política egoísta que no piensa para nada en bien del País ni en el Pueblo, sino en sus propios beneficios económicos y políticos. Y Think Progress ha demostrado con claridad meridiana el daño que les hacen a nuestro País los fondos buitres con el fin de seguir enriqueciendo billonarios estadounidenses a la par que se sigue empobreciendo nuestro gobierno y se lanza a nuestra gente a mayor austeridad y pobreza. Esto es tan indignante para los observadores decentes, que ThinkProgress ha citado al candidato a la presidencia de Estados Unidos (Independiente, por Vermont), Bernie Sanders, quien ha catalogado de “moralmente indignante” (“a moral outrage”) que se trate de imponer mayor austeridad al Pueblo de un país como Puerto Rico, donde el 56% de sus niños ya viven bajo el nivel de pobreza. Máxime cuando, como indica Sanders, todo eso se pretende hacer con el fin de convertir en más ricos todavía a los billonarios estadounidenses que “invierten” en fondos buitres para prestarlos a nuestro gobierno interno a precios de usura, como han hecho ya en Grecia, Argentina y otros países caídos en crisis fiscal. Como siempre ha ocurrido en la historia de las relaciones coloniales, las autoridades oficiales de la metrópoli culpan exclusivamente a los habitantes de la colonia. Lo hizo Inglaterra cuando la situación en la India entró en crisis, e igualmente lo hizo Francia en Argelia. Los culpables son los habitantes de la colonia, que ellos, los dominantes, suponen inferiores. No son ellos, que son ricos y además se autoproclaman “civilizadores”. La situación en las relaciones entre Estados Unidos y Puerto Rico se agrava para todos por cuanto las autoridades de la metrópoli reaccionan a todo, no sólo echándonos la culpa como si ellos fueran observadores inocentes, sino con reiteradas negativas o actos de desatención e indiferencia ante los reclamos del País. Uno que otro legislador inconsecuente, que viene a Puerto Rico a buscar dinero para que los incautos y colonizados boricuas le ayuden a financiar su campaña de re-elección, dice de labios hacia afuera que el Congreso “debe ayudar más a Puerto Rico” pero, al fin y a la postre, NO hace nada concreto para lograrlo. Al mismo tiempo, las acciones y escritos oficiales del Congreso, de la GAO y de otras autoridades importantes de Estados Unidos están repletas de indiferencia o de un NO rotundo. No, a eliminar la aplicación de las leyes de cabotaje para Puerto Rico. No, a aprobar algún rescate o “bail-out” para el gobierno del País, aunque sí se lo dieron a los bancos de Wall Street. No, a que podamos tener el derecho a la protección de la ley de quiebras federal. No, a que podamos hacer nuestra propia ley de quiebra para nuestras corporaciones públicas. En lo político: indiferencia y un “no indirecto” al proyecto de Pierluisi sobre la estadidad federada. La última joya en este aspecto la trajo el senador Republicano por California, Darrel Issa, quien dijo claramente que el proyecto de Estadidad para Puerto Rico de Pedro Pierluisi es un “elemento distractor”. ¿Y por qué es distractor? A buen entendedor con pocas palabras basta. Es distractor porque es una fantasía, no tiene las más mínimas probabilidades de ser atendido por el Congreso: no sólo no lo van a aprobar, sino que ni siquiera lo van a discutir. Por lo tanto, Issa dijo con razón que dicho proyecto distrae de lo importante: atender la crisis fiscal de Puerto Rico. Y el candidato Republicano Jeb Bush, hijo, de quien una vez gritó aquí falsamente “Estadidad Ahora”, ya les dijo claro a los estadistas: arreglen la crisis fiscal primero, y luego entonces, planteen la estadidad. Esto ha sido claramente decirles: olvídense por buen tiempo (para no decirles más humillantemente que para siempre) del supuesto “proyecto histórico” del PNP. Al mismo tiempo, las autoridades estadounidenses le han dicho claramente al PPD que no es constitucional el llamado crecimiento orgánico del Estado Libre Asociado territorial, con lo cual le entierran también su supuesto “proyecto histórico”, ése que ha defendido todavía la cúpula que controla dicho partido. ¿Qué más cantazos y vapuleos de la metrópoli necesita el Pueblo de Puerto Rico para entrar en una situación pre-revolucionaria y a favor de un cambio verdaderamente descolonizador? Los dos partidos principales del bipartidismo tóxico que asfixia al País están sin proyecto histórico viable o creíble. ¿A causa de quién? De la metrópoli estadounidense que niega ambas cosas: una por inconstitucional (ELA territorial con más poderes) y la otra por indeseable para ellos (la estadidad). El grito de que “el ELA debe crecer” dentro del marco territorial, que lanzó García Padilla el 25 de julio en Sabana Grande, ha quedado como lo más absurdo y patético que pueda proclamar líder alguno en Puerto Rico, porque la propia metrópoli ya ha dicho que ese camino está cerrado por anticonstitucional. El ELA territorial no puede crecer hacia una situación sin leyes de cabotaje, por ejemplo, porque ya la GAO dijo que eso afectaría negativamente los intereses de Estados Unidos. En todo lo que se examina o plantea, los intereses de EEUU valen el 100% y los del Pueblo de Puerto Rico 0%. ¿Alguna semejanza entre eso y los tiempos de la “luna de miel” con el Estado Libre Asociado territorial en los años 1950 y 1960 del siglo pasado? Ninguna. Las relaciones entre Puerto Rico y Estados Unidos han dado un giro de 180 grados por voluntad de la metrópoli. Y el otro reclamo, el de Pierluisi sobre la estadidad como solución a la crisis fiscal, se ha estrellado igualmente contra la indiferencia del Congreso, ante el informe económico de la GAO sobre las inconveniencias de la estadidad y frente al hecho incontestable de que Estados Unidos no quiere un nuevo estado que esté en las condiciones económicas y fiscales en las que se encuentra Puerto Rico. Ante todo eso, resulta risible y ridículo el llamado “Plan Tenesí” de Ricardo Rosselló. Tan humillados han quedado los estadistas en Puerto Rico que ahora resulta que ellos mismos explican el Plan Tenesí como algo muy venido a menos, una especie de “Plan Tenesito Jíbaro y Humillado”. El verdadero Plan Tenesí consistía en elegir senadores y representantes y mandarlos a Washington a exigir un asiento y la admisión como estado federado. Ante las negativas e indiferencias de Washington, los estadistas del PNP ahora explican el “Plan Tenesito Jíbaro y Humillado” como el de enviar unos cabilderos para mendigar a favor de la estadidad en los pasillos del Congreso. ¡Pero si eso es lo que ha hecho el PNP toda la vida! Gastar millones en cabilderos que entretienen a congresistas corruptos o inmorales que reciben dinero, regalos y prebendas de los dirigentes estadistas de Puerto Rico, prometen ayuda, y luego la misma se traduce en declaraciones huecas que NO implican acción pro-activa alguna. ¡A eso han reducido los dirigentes del PNP el Plan Tenesí! ¿Por qué? Pues porque por fin se dieron cuenta de que la ley federal no les va a permitir elegir congresistas puertorriqueños para enviarlos a Washington, porque Puerto Rico, como territorio no incorporado, no tiene derecho a eso. Operar el Plan Tenesí desde Puerto Rico, un territorio no incorporado, no sólo es ilegal sino que viola la constitución de Estados Unidos, la cual sólo concede a los estados federados el derecho a elegir congresistas. No les dejarían ni imprimir las papeletas para esa supuesta elección, como se las hicieron retirar a Pedro Rosselló González cuando intentó hacer un “simulacro” de voto presidencial en Puerto Rico. Por lo tanto, ante la imposibilidad de aplicar el verdadero Plan Tenesí, los dirigentes del PNP se conforman con nombrar a dedo a unos puertorriqueños que se la van a pasar gastando dinero del País como cabilderos, a ver si logran convencer a algunos legisladores de que por lo menos le den apoyo de “lip service” a su “ideal” de estadidad federada. Patético y deleznable, evidentemente. Todo lo que nos llega de la metrópoli, en lo económico y en lo político en estos tiempos es: No y No y No. Con esta realidad, los partidos y sus dirigentes políticos han perdido toda credibilidad ante la mayoría de los puertorriqueños, que no somos tontos. Siempre hay fanáticos que les siguen y les vitorean, por las razones que sean, como la señora de más de 70 años que dijo en Sabana Grande que sería “Popular hasta la muerte”. Pero la mayoría de quienes no son fanáticos, piensan con su cabeza y tienen más de dos dedos de frente, aun entre quienes en el pasado han sido votantes del PPD o del PNP, hoy tiemblan ante la desesperanza y la incertidumbre. Muchos todavía prefieren el “flanco de la huida” de una manera u otra: la huida del proceso electoral sumándose a los abstenidos, la huida frente a la crisis y baja calidad de vida en el País, yéndose a vivir fuera de Puerto Rico y la huida de condiciones económicas y políticas duras a base de chupar lo más que puedan, para ellos y sus familias, de las piltrafas que han quedado de los recursos de nuestro gobierno interno o de los gobiernos municipales. Con ello rehúyen, además, de actuar con patriotismo: se salvan ellos, aunque el País se hunda en la miseria. No les importa un pepino el País. Se reparten contratos en la CEE para beneficiarse personalmente, incluso si eso significa que ese mismo gobierno, esa misma estructura gubernamental, deja sin desayuno a miles de niños puertorriqueños con la excusa de que no hay agua en las escuelas. Con lo dicho, ya vamos atisbando algunas de las razones por las cuales la situación en Puerto Rico, en el plano político, no se acaba de mover hacia un cambio profundo. Todo se deteriora en nuestra institucionalidad: los partidos, el gobierno y la administración pública, la supuesta democracia, las relaciones con Estados Unidos, las infraestructuras físicas, los centros comerciales que cierran tiendas todos los días, la capacidad del gobierno para atender las necesidades de sus ciudadanos más vulnerables, etc. No obstante, el País está en una situación de inmovilismo donde el viejo sistema económico, político y social se deteriora y se desgrana poco a poco, pero no acaba de morir, y lo nuevo, el País del futuro, no acaba de nacer. Por qué estamos en esa situación es algo que amerita un análisis sistemático y a fondo. A eso precisamente dedicaré mi próxima contribución a CLARIDAD: ¿Qué factores explican que no entremos plenamente en una situación pre-revolucionaria que nos dirija al cambio? ¿Qué fuerzas internas y externas nos mantienen a la deriva y sin norte? ¿Cuáles pueden ser algunas de las vías al alcance de nosotros, los ciudadanos constructivos que realmente amamos el País, para enfrentar esas fuerzas, debilitarlas y hacer posible el cambio hacia un proceso liberador, descolonizador y constructivo? * El autor es Profesor de Ciencia Política en la Facultad de Ciencias Sociales del Recinto de Río Piedras de la Universidad de Puerto Rico. angeisra@hotmail.com. The White House has rejected a bailout package for Puerto Rico days after the U.S. territory failed to pay a small portion of the massive $72 billion it owes to bondholders. It was the biggest municipal bond default in U.S. history. Unlike U.S. states and municipalities, Puerto Rico cannot declare bankruptcy. Juan González discusses how the roots of the crisis are deeply tied to Puerto Rico’s colonial status. AMY GOODMAN: Juan, you just wrote a piece in the New York Daily News today called "Puerto Rico’s Economic 'Death Spiral.'" Explain what’s happening. And one of the points I tried to make in a column today, that this is part of a 117-year relationship of colonialism. This is part of the colonial status of Puerto Rico. Even the Marxist historian Richard Wolff this week claimed that Puerto Rico was a semi-colony. No, Puerto Rico is not a semi-colony; Puerto Rico is a colony of the United States. And I pointed to the decisions of the Supreme Court that ratified this colonial situation. It’s called—a bunch of decisions that were rendered in the early 1900s, called the Insular Cases, when Puerto Rico had just been acquired after the Spanish-American War. And in a five-four decision back then, the same five judges, by the way, that decided Plessy v. Ferguson, the separate but equal situation, that same five-judge conservative majority back at the turn of the century said in their decision—it was called Downes v. Bidwell—"the island of Puerto Rico is a territory appurtenant and belonging to the United States, but not part of the United States within the revenue clauses of the Constitution," basically saying that the Constitution only applied in Puerto Rico those portions that Congress decided, deemed necessary to apply. So the problem for Puerto Rico has been for 117 years that all major decisions about the island are made by Congress, not by the elected officials of Puerto Rico themselves. JUAN GONZÁLEZ: Well, it’s unbelievable. I mean, right now you have a situation where just a few weeks ago the government raised the sales tax from 7 percent to 11 percent. It has already effectively eliminated all the defined-benefit pension funds of government workers. Now, between the hedge funds and the economists, the IMFeconomists who are coming in, saying the only way to get out of this is by more austerity, they now want to eliminate protections from overtime. They want to—they want to encourage the island of Puerto Rico now to sell off all of its publicly owned—it’s already sold off its airport, privatized its airport, and some of its toll roads. Now they want it to sell the ports, to sell government buildings, to basically sell any government assets as a means to raise money. They want to reduce Medicaid. They want to lower the minimum wage. They want Congress to lower the minimum wage below that of the federal minimum wage. They want to create an even deeper cut in wages for young people. They basically want the population to bear the brunt of the economic problems of the island. And I think that what the leaders of Puerto Rico are saying: "Hey, we’re in this together. All of these Wall Street firms kept pedaling loans to us." Just last year, $3.5 billion in new bonds were issued, largely bought up by hedge funds, because Puerto Rico already had junk bond status for its debt, so it couldn’t raise money. So the hedge funds came in, and they said, "We’ll give you $3.5 billion in new loans; however, it comes at an 8 percent interest rate." Now, understand, Puerto Rico is triple tax-exempt for anyone in the United States. That’s the great secret of how people—the finance community has made money off of Puerto Rico. That 8 percent is worth about 12 or 13 percent to—if it’s triple tax-exempt to anybody who invests in those bonds. So they’ve been making a killing, but they specifically said, "Not only do we get first priority—we’re the general obligation bonds. We get first priority for any payments of money that the government gets in. But if there’s a dispute, this dispute will not be heard in Puerto Rican courts, it will be held in New York courts." So they were already preparing for the possibility that the island would default, but they wanted to have the courts on their side. So you see that this—the hedge funds, especially, are demanding they’re first in line, they want payments. And the government of Puerto Rico is saying, "Look, if we’re going to suffer, if we’re going to make further cuts in Puerto Rico," as they said in Greece, "the bondholders have to suffer, as well. They have to accept losses. They have to restructure the debts." And that’s the problem, is that the Puerto Rico government can’t do that right now, given the reality of its colonial situation. So, we’ll see what happens in the coming months. The Government of Niue has established Diplomatic Relations with the Republic of Kosovo (on) 23rd June 2015. The newly forged relationship is the first Diplomatic Relation Niue has established with a country from the Southeast Europe region. The Republic of Kosovo becomes the 12th country to establish Diplomatic Relations with Niue. Facts about: The Republic of Kosovo is a state that was established in 2008 in the central Balkan Peninsula. It is bordered by the Republic of Macedonia and Albania to the South, Montenegro to the West and Serbia to the North East. The Premiers Office holds the Niue Legislative Assembly, Cabinet, Central Agencies, Commercial Agencies and Statutory Boards. A full description of the divisions under the Premiers Office can be located in the Cabinet Page. planning and architect of the long standing construction. The previous structure contained different departments within the Niue Public Service, however the new transformation involves the collective of all departments under 3 Ministries and 2 Agencies. Ministry of Social Services, Ministry of Natural Resources and Ministry of Infrastructure, Central & Commercial Agencies. The new structure is designed for efficiency and to expedite delivery of Services. The Government of Niue continues to encourage the Development of Niue for the Benefit of ALL Niueans in Niue as well as Abroad. The Premier of Niue says other nations are making it poor by not sharing returns made off of Niue's resources. US$3.4 billion worth of tuna was caught in the Exclusive Economic Zones of Pacific Countries last year with an additional 400 million dollars worth of tuna estimated to be taken illegally. Pacific owners receive around 14 per cent of the market value of the resource. Toke Talagi told the United Nations Security Council Niue is often described as poor despite having plenty of fish and sea-bed minerals. He says other countries need to rethink their behaviour in the Pacific. Talagi says true partnerships need to be developed that endorse sustainable harvesting of resources in Niue.